Stanton 60" vanity features a Carrara white marble countertop, and is fully constructed of quality woods for maximum rigidity and longevity. The clean lines bring a crisp and contemporary look to any bathroom, while the marble countertop gives it a timeless flair. The white Carrara marble countertop, rectangular under-mount sink, and satin nickel-finish hardware is highlighted against the white cabinetry. 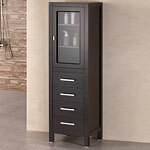 For storage, this vanity features eight drawers and a soft-closing double-door cabinet. Included is a large matching framed mirror. The item looks beautiful just as pictured. Very clean and stylish piece of furniture. The square sink is also a nice twist that I'm sure our tenants will love. Service was also very good.